The bleak, themeless landscape of 'Lemminkäinen in Tuonela' is conveyed with impressive power (...). He also offers a vividly characterised Pohjola's Daughter, another spellbinding Sibelian masterpiece. It's thrilling to hear Sibelius's most remarkable structures from an orchestra under impassioned leadership that's probably never sounded better. Textures are sifted with skill, chosen tempi are unfailingly judicious and Lintu shows a canny awareness of the bigger scheme. I appreciate the and thrust he brings to 'Lemminkäinen and the Maidens on the Island' (the crisp accenting in the winds and strings throughout will make you sit up), and in 'The Swan of Tuonela' he draws some agreeably luminous and breathtakingly hushed sounds from his string choir. 'Lemminkäinen in Tuonela', too, boasts impressive control. 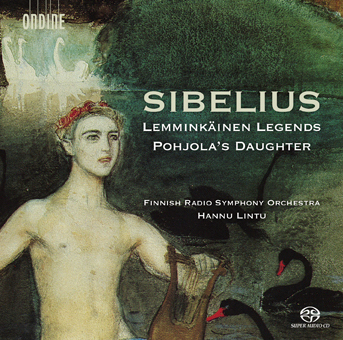 Lemminkäinen Legends is a large and fascinating orchestral work in four movements based on the Finnish Kalevala epic. Originally completed in 1895 the work has a unique position in Sibelius' oeuvre: Sibelius never came closer to the very core of Symbolism than in the misty moods, swan motifs and macabre features of Lemminkäinen. It also includes one of Sibelius' most well-known orchestral pieces, The Swan of Tuonela. Written before the 1st Symphony, it is also noteworthy that Lemminkäinen lacks nothing of a symphony. Sibelius was not totally satisfied with the work, but withdrew the work soon after its premiere until it was heard again in 1935. However, in his late years Sibelius did not even totally reject the idea of calling Lemminkäinen as ‘a symphony'. Pohjola's Daughter (Pohjolan tytär), completed in 1906, is among Sibelius' final orchestral pieces directly linked to the Kalevala epic in his transition from National Romanticism towards a more Classical idiom. It includes some of the boldest and most dramatic scoring that Sibelius ever wrote, illustrating Väinämöinen's futile attempts to win the maiden of Pohjola for himself. Year 2015 marks the 150th Anniversary of the birth of Jean Sibelius (1865-1957), also known as "Finland's national composer". The recent recordings of the Finnish Radio Symphony Orchestra together with their Chief Conductor Hannu Lintu on Ondine have gathered excellent reviews in the international press.